GNU screen helps you get most out of your desktop's real estate, in cases where you need to work on more than one terminal simultaneously. Using GNU screen, you can have as many processes as you need, such as editors, web browsers and shells, all within a single terminal window. Every desktop system allows you to open multiple terminals in different windows, and most terminal programs let you run multiple sessions at once using tabs, but GNU screen is often easier to manage and less confusing when you have many sessions. 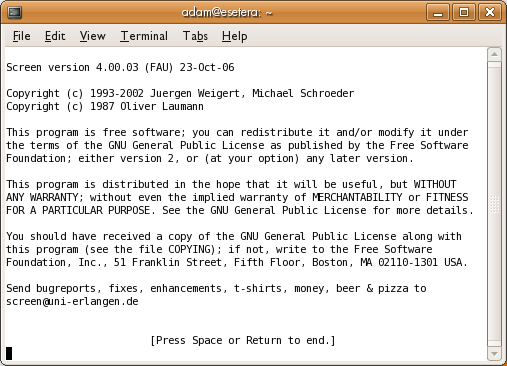 Additionally, GNU screen offers a copy-paste mechanism to transfer pieces of text easily within the multiplicity of sessions handled by it. It can be used in an ordinary text terminal as well as on the desktop, and for most purposes it is an alternative to using multiple text terminal sessions and moving between them by the Alt + F# key combinations. Start by typing screen in your command prompt. You get a welcoming message and some versioning information, or your system may be configured so that it goes directly to a shell prompt. If you press Enter you get a shell prompt, just like before you invoked screen. You are now running within a single session of screen. In order to create a second session with its own shell, press ctrl + a followed by c or ctrl + c. All screen commands begin with ctrl + a but if you need to use that for some other purpose you can change that key binding. See the manual (type "man screen" at your bash prompt) for this and many details we will not present here. To switch to the previous shell, enter ctrl + a followed by the p key. To go forward again, enter ctrl + a followed by the n key. You can see a list of all the sessions you have created using ctrl + a followed by the " key. This presents a scroll-down menu listing all open sessions (very helpful when you have created many sessions!). If you want to save even the half second it takes to scroll down the menu, while being able to see a list of available sessions and instantly jump to another session, enter ctrl + a w. This keeps you in your current window, but adds, at the bottom of the screen, a list of sessions with a different number for each. Then enter ctrl + a session_number to jump to the session of your choice. Suppose you created a few sessions under GNU screen. In one session you have a Vim editor open, a couple more sessions you use for logging in to different remote servers, another session you use to run FTP, and so forth. By default, ctrl + a " shows the program you used to start each session. Normally you started it with the shell, so ctrl + a " shows "bash" for each session (or whatever your shell is). This isn't very helpful if you want to quickly find the session that's running Vim or FTP. It turns out that customizing the display is easy. While you are in a session--say, editing in vim--press ctrl + a A and you get a line at the bottom of your window with the name of your session, which you can edit to your liking. Press ctrl + a [ to go into screen copying mode. Navigate through the text anywhere in your window, using arrow keys or editor commands or whatever works in that session. At one end of the region of interest, press the spacebar. Navigate to the end of the region of interest (text is highlighted as you proceed with your selection). Press the spacebar again to copy the text to the clipboard. Switch to the session where you want to copy the text, navigate to the right place and press ctrl + a ]. This pastes the selected text into the edit buffer or onto the command line or whatever, depending on what that session is doing. With either the mouse method or the screen method, text is taken from the video memory, which does not preserve the escape sequences that make colors, boldspace and so on. That is probably what you want if you are copying examples from a manual onto a command line, but maybe not what you want if you are taking exerpts from one file to another. Besides multiple full-screen windows, Screen can also allow two or more programs to share the screen at once. Use ctrl + a S (capital S) to divide your screen into two parts. Your original session is at the top and a new blank session at the bottom. (Be careful you don't accidentally press ctrl + s. This can lock up your terminal. If you do accidentally hit ctrl + s, you can unlock the terminal with ctrl + q.) By default, there is no program running in this new region, but you can start one by using ctrl + a tab to move to that region and then typing ctrl + a c.
Each region acts as an independent session, and you can switch between sessions just as in fullscreen mode. You can remove the current region by using ctrl + a X. This won't destroy the session or what's running in it. It just turns the other session back into a full-sized window. One of Screen's most powerful features is the ability to halt and restore sessions. Say you're doing something really interesting on your computer, but you have to leave and go to work. Now say that while away you want to access what you were working on. If both machines are accessible through the Internet, you can do that with Screen. For example you may start a session on a remote machine using the telnet or the safer ssh protocol, and then invoke screen. When you have to leave, you can safely close the remote Screen session and later restore it, maybe accessing the remote machine from the command line of a third machine located in another suburb -- or in another continent. Type ctrl + a d in your screen session. You return to your original terminal and the screen exits, printing [detached]. Now if you execute ps, you find that the screen is still running in the background. Get a list of all running sessions by passing screen the -list option. This reconnects to the first session it finds. Now all you have to do is log into your home machine from any remote machine and you are able to see whatever you were working on, exactly as you left it. Use the same procedure to put a download into the background with wget, or ftp. A detached session persists even if you log out from the machine. If you have only a few programs open, you can exit screen simply by quitting them all. However, if you have many different application and windows open, you can exit them all by typing ctrl + a \. You are prompted for confirmation, and if you select yes, Screen terminates all its programs and exits.